WorldClassRoom FAQs - How can I submit feedback about WorldClassRoom itself? Webster University's WorldClassRoom is powered by the learning management system Canvas, which was created by a company called Instructure. This tutorial will show you how you can submit feedback about the Canvas platform to help improve how it functions. If you have feedback about your course or instructor, please see the tutorial titled How can I submit feedback about my class and my instructor? If you have other feedback which is not directly related to Canvas, how WorldClassRoom operates, or a specific course or instructor, please contact the Online Learning Center at studyonline@webster.edu. We are happy to review your feedback or pass it along to the appropriate party. Instructure welcomes feedback and suggestions from their users as to what features they would like to see implemented to improve Canvas. The more users who "vote up" or provide support backing other users requests, the more likely it is that Instructure will take the request into consideration. Therefore, you should always consider adding your voice if you have a suggestion. Click the Help button at the bottom left of the Global Navigation menu. In the Help menu, click Submit a Feature Idea. This takes you to an area called the Canvas Community which is accessible to Canvas users worldwide. First, search the Canvas Community for any existing requests which might match your idea. There are two ways to do this. If you know which category your request would fall into, click on the name of the appropriate category title to review the requests which have already been submitted. 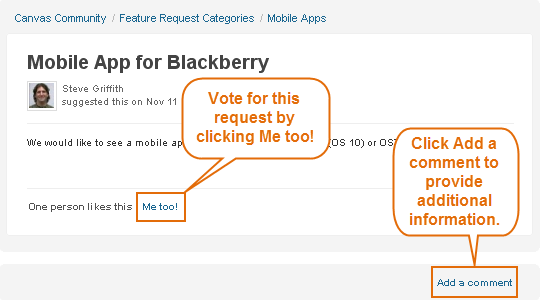 For example, if you would like to see a mobile app for Blackberry devices, look in the Mobile Apps category. If you are not sure of the category, try typing in the search bar. Enter your search terms in the text box and click Search. It is recommended that you use general terms for optimal results. For example, if you would like to see a mobile app for Blackberry devices, try searching "Blackberry" or "mobile app." 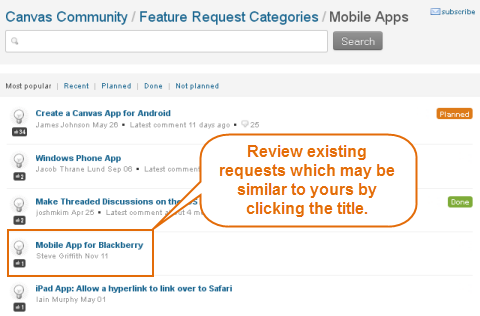 If you locate an existing request which may fit with your suggestion, review it by clicking the title. If would like to lend your support to the request you are currently reviewing, click the Me Too! link and to cast your vote. You may also consider providing additional detail as to why you are in support of this request or other information about your request. To do this, click Add a comment. 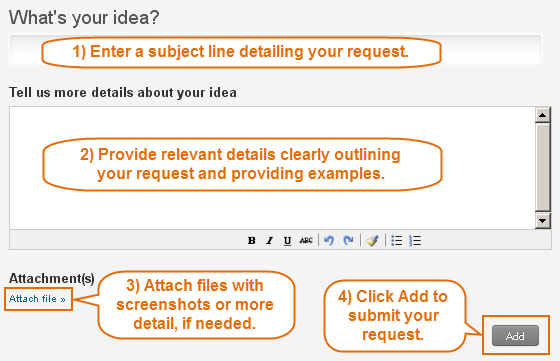 If your search did not return any existing requests similar to your idea, you may wish to add a new request. 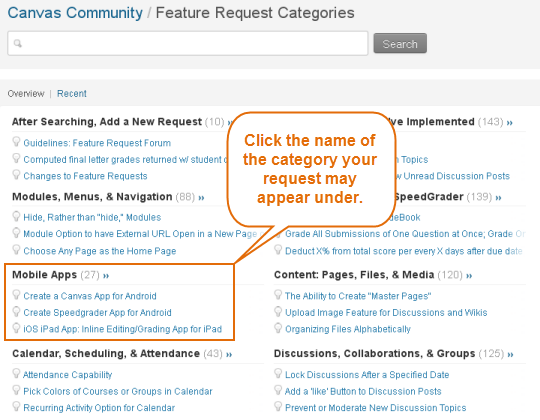 Return to the Feature Request Categories page which you entered on from WorldClassRoom. Select the category titled After Searching, Add a New Request. Review the topic titled Guidelines: Feature Request Forum for information about what sort of detail you should provide in your request and how Instructure handles this feedback. This information will be utilized in Step 6d. After reviewing this page, click your browser's back button to return to the category page titled After Searching, Add a New Request. Click Request a Feature. Using the information provided on the Guidelines page reviewed in Step 6b, enter the subject line of your request and relevant details. Provide as much information as you can so that it is clear to Instructure and other users what you are asking for. You may also attach files to support your request, if desired. Click Add. Your request will be temporarily added to the After Search, Add a New Request until it is reviewed by Instructure and assigned to a category. Remember that votes are one of the ways to draw Instructure's attention to your request, so be sure to ask other Canvas users to support your request!